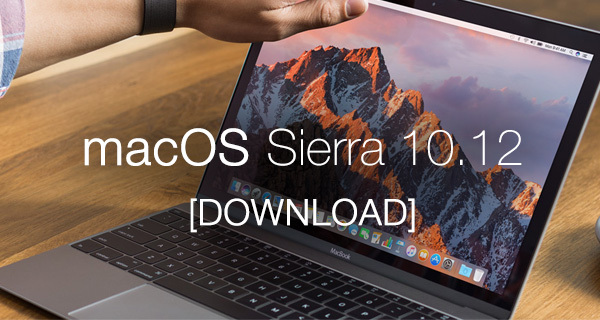 Apple has just made final macOS Sierra 10.12 download available to all after months of developer and public testing, meaning that compatible Mac owners can get their hands on it right now. 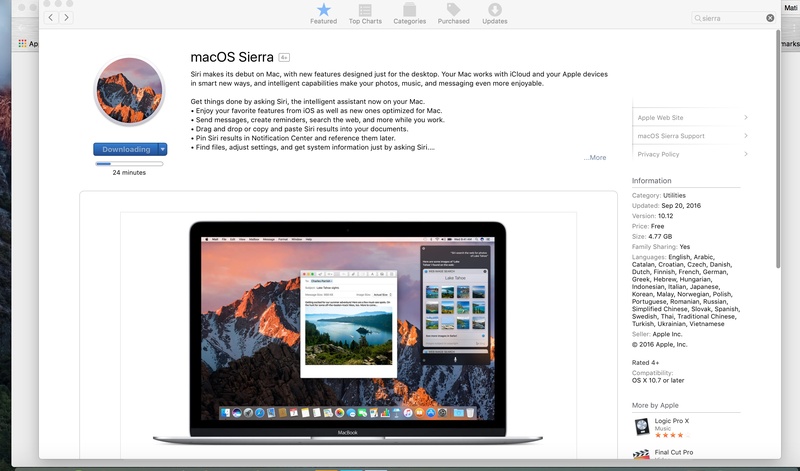 Apple officially introduced macOS Sierra to the world back in June as part of the opening keynote of this year’s Worldwide Developers Conference. The announced features and firmware improvements managed to draw a rapturous applause from the developers in attendance, but it was possibly the name change from OS X to macOS that managed to garner the most excitement from the crowd. With macOS Sierra born, the next three months were spent issuing developer betas to those registered with the Apple Developer Program, and public betas to those registered with the Apple Beta Software Program. From a feature perspective, Apple has definitely packed enough into the maiden version of macOS to keep Mac owners happy. Sierra 10.12 ships with access to Siri for the first time officially within the company’s desktop operating system. This includes being able to interact with Siri’s famous wit and humor, as well as accessing the usual functionality like finding and showing files in Finder, or making instant web searches for content. macOS Sierra also features a universal clipboard feature, as well as Auto Unlock that allows a Mac to be instantly unlocked when an Apple Watch is in proximity. Perhaps an even greater change is the ability to sync Desktop and the Documents folder between multiple machines running the same Apple ID. For a full list of new features and improvements in Sierra, you can refer back to our previous post on the subject here. Of course, if you’re planning on taking advantage of getting macOS Sierra as a free-of-charge update, you’re going to need to check to see that your Mac supports it and is compatible. We have a compatibility list here: List Of macOS Sierra 10.12 Compatible Macs. 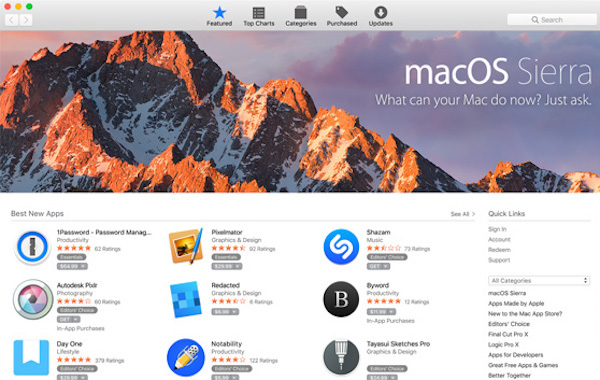 macOS Sierra is available as a free-of-charge download from the Mac App Store right now. Once downloaded, simply hit the install button to begin installing from there. Alternatively, in case you want to do a fresh clean install on your Mac, once again, for your convenience, we have that covered here: How To Clean Install macOS Sierra 10.12 On Mac [Tutorial]. My time is 1 pm at eastern time and its not up yet. I guess I will wait. same as latest GM released last week. Just download macOS Sierra from App Store and update from install macOS Sierra 10.12 app from Launchpad. [HELP!] I am on 10.12 Beta (16A312a), which is not the GM version. Now I don’t see #macOSSierra on my updates. So can I just download directly from App Store now? It is better to have a clean installed instead of upgrade it. I can’t fully download it. It stop downloading in a certain amount of memory then it gives error message.